East Lansing is Spartan Country and when the Spartan Football team takes on our in-State rival, the Michigan Wolverines...let&apos;s just say, passions run deep. All over the community you see people declaring their allegiance in this bitter collegiate turf war. Obviously with campus right here, you can&apos;t go anywhere in East Lansing without seeing lots of green. You do, however, I have to admit see a fair amount of Michigan fans as well. Whether its bars, restaurants, retail stores or even peoples homes and cars, you see it. Green. Blue. Go State. Go Blue. Go Green. Here&apos;s hoping for another year of Spartan dominance in a classic rivalry. The Michigan vs. Michigan State Game, where these two Big Ten Interstate Rivals face off, is always one of the most highly anticipated games of the season! The Michigan-Michigan State rivalry attracts more fans than any other rivalry in college football, except the Michigan-Ohio State rivalry. 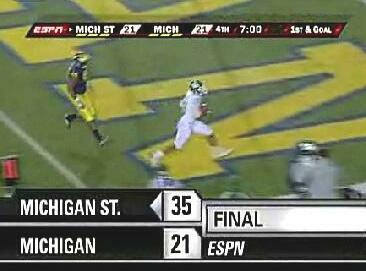 And no team, not even the OSU Buckeyes, have upset the Wolverines more often than the Spartans have. The first meeting between these two rivals came in 1898 where the Michigan Wolverine shut out the Michigan Agricultural College (MSU) 39-0. Michigan then went on that year to win the Western Conference, now known as the Big Ten Conference, championship. Every fall since then, with the exception of 1943 & 1944 due to World War II, these two rivals have battled it out for 4 quarters on the grass of either The Big House, or Spartan Stadium in hopes of a victory, bragging rights and the Paul Bunyan Trophy. The Paul Bunyan Trophy was first presented in 1953 to the winner of this annual game by Michigan Governor G. Mennen Williams. The coveted Paul Bunyan Trophy is a four-foot-high wooden statue on a five-foot-high base, and is named after the mythical giant lumberjack Paul Bunyan to reflect the state&apos;s history as a major lumber producing State. Michigan currently holds the series record at 67-32-5. MSU&apos;s period of dominance in the series&apos; history was from 1950 to 1969, where they went 14-4-2. The Wolverines hold long winning streaks of six (2002-2007), eight (1970-77), and 10 games (1938-49), and an 18-game unbeaten streak from 1916 to 1933, in series history. The MSU Spartans also have won the past four meetings from 2008-11. Whichever side you choose in this annual battle (obviously, the GREEN side is the far better of the two...) this is always a game full of passion, in a community full of passionate sports fans.